Organic tomatoes grow on vines planted in soil in a greenhouse at Long Wind Farm, in Thetford, Vt., on April 2, 2018. Experts peg the price premium for organic food products at between 20 and 60 per cent. All but one item – spinach – out of 17 were at least 20 per cent more expensive in the organic section, according to a 2016 study by the U.S. Department of Agriculture. Eggs and milk tended to be among the costliest. Several organic and conventionally grown items consistently boast comparable prices – “The Big Five,” as dubbed by Pat Pessotto, vice-president of merchandising and procurement at Longo’s, a southern Ontario grocery chain. Apples, carrots, cauliflower, broccoli and prepacked salads make up the bunch. 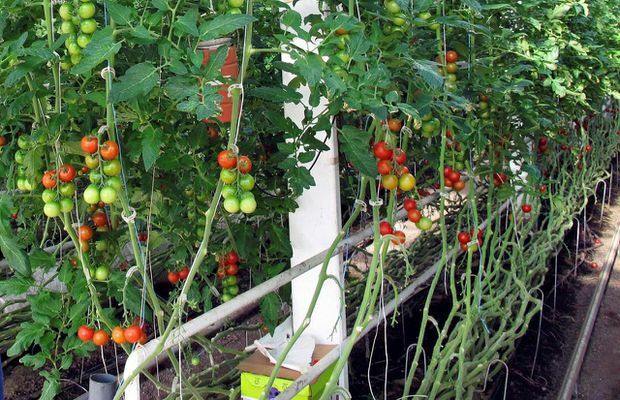 They’re often locally grown – meaning lower transport costs – and have longer storage times, making them less susceptible to price fluctuation. Meanwhile, organic bell peppers and bananas cost $3 each and $1.29 per pound, respectively, versus $1.67 each and 79 cents per pound for their conventionally grown brethren – a top-up of 80 per cent and 63 per cent. The price premium derives partly from higher costs for farmers who swear off products such as synthetic fertilizers, sewage sludge and genetic engineering as well as growth hormones and antibiotics. But it also comes from processors and retailers who must ensure organic products don’t rub leaf by jowl with non-organic items during storage or transportation – all necessary to earn organic certification from the Canadian Food Inspection Agency. One way to skirt that premium is to toss a house-brand organic item in your cart rather than a non-organic branded one, she said. Adopting a coupon-collecting habit is another option. Buying in bulk – including direct from the farm – and growing your own greens, from kale to coriander, can also cut costs while still yielding the benefits touted by organic champions.